Issue 7 of Work in Progress has been many months in the making, and showcases the work of Christof Mascher, Nicole Dyer, Naoki Tomita, Lise Stoufflet, and Patrick Brennan. Each of these artists have carved out their own language and body of work through painting, yet threads of playful fantasies, anxious realities, and questions of what we see and how we remember are strung across their diverse practices. Patrick Brennan’s work presents explorations of materiality, representation, abstraction, and perception. They question what abstraction is and investigate the ideology and perceived realities of shapes, symbols, and forms. Across his work, materials and color are the central figures. Nicole Dyer’s pieces visualize emotional responses to specific memories, moments, and thoughts, balancing nostalgia with anxiety, and insecurity with revelatory excess. 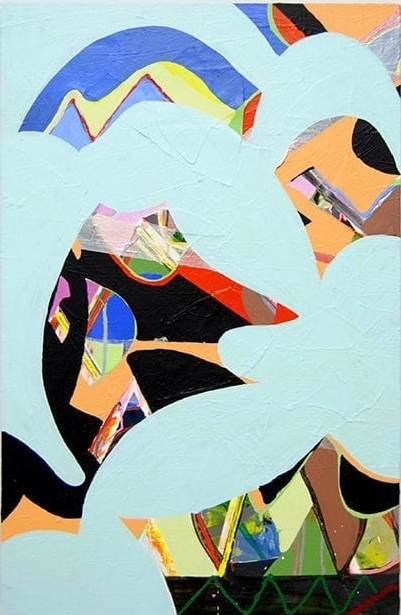 Dyer’s paintings are playful. Glitter and rhinestones are commonplace among her acrylic-painted canvases, and they engage the viewer in the ridiculousness of our everyday personal and social lives, playing with our perceptions of material and form, but also pushing us to dig deeper and interact with through her own visual language. This playfulness and kitsch is also present in the work of Christof Mascher. With bodies of work ranging from oil painting to tapestry, lithography, and watercolor, Mascher is no stranger to material experimentation. But his playfulness also extends to his subjects, which he uses not as a means to a narrative scene, but rather as a grounds for understanding and investigating our perception of imagery. Humor operates at large in his work, but there is also an incredible attention to color and atmosphere that activates imaginative, fantastical, and emotional responses to his works. Sometimes a scene is unrecognizable beyond its marks or symbols, other times it is a clearcut landscape. In both instances, Christof maintains the same experimentation with figurative language and perception. For both Naoki Tomita and Lise Stoufflet, representation and image are central to their practices. Tomita’s paintings are thick and dense with paint. Working from photographs — both collected imagery and his own photography — realism and representation are central to his practice. However, the thickness of his strokes of paint blurs this representative precision into figurative abstraction and impressionistic painting. Lise Stoufflet’s works are richly figurative, yet disconcerting in their presentation of narrative. The scenes of her paintings are not always clear and, often times, unsettling and surreal. Marrying her subjects with her atmospheric color palette, Stoufflet’s works are evocative and mysterious, forcing viewers to question what they think they are seeing and understanding. Across the breadth of these artists’ work exist investigations into how we as viewers are reading, translating, and internalizing what is presented visually to us. How can an abstract painting be truly abstract and viewed within its own language and context? How can a figurative work challenge our understanding of narrative and blur our perception of memory, reality, and fantasy? These broad questions circulate amongst these artists’ practice, and Issue 7 presents their work in dialogue, exploring these complicated questions and issues with visual representation and perception. I want to thank all the artists involved in this issue for their incredible patience and cooperation. I also want to extend special thanks to Sabrina Horak who acted as a translator for my Skype interview with Naoki. Translation, especially as an intermediary in a live conversation, can sometimes be awkward, but Ms. Horak was incredibly patient and thoughtful and I appreciated her help in making Naoki’s interview possible. Finally, this issue celebrates the launch of Work in Progress’s new logo! Building this platform has been a lot of work, but I’m so happy to now have a logo that helps give WIP its own visual identity. Special thanks to Marcus Hedgpeth for the design. Marcus is an incredible graphic designer and collaborator, and you can check out his work on Instagram @okny and on his website www.okny.co.